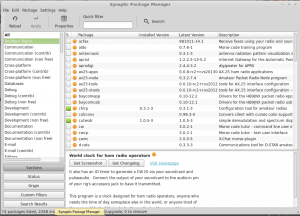 In this view we have categories of the different packages listed on the left panel, with a list of packages on the right and a short description of each package listed in the panel just below that. In this view we can see that we are currently browsing the 'Amateur Radio' category, in which we have selected the 'twclock' (just off screen). Some good categories to look in are 'Amateur Radio' 'Electronics' and maybe 'Embedded Devices' if your interested in ARM development. For our purposes there are little difference between those marked as 'Contrib' and 'Non-free', as these relate to who maintains the package and the openness of the license respectively. For instance the schematic capture software Eagle is in Electronics (non-Free) as it has a component you pay for. To install the package of interest, click the check box to the left of the package name, and select mark for installation. That line will then turn green and the check box will be filled. If you change your mind you can simply click the check box and select 'unmark'. This can be done for any number of packages and the packages will be installed once you click the apply button in the upper left of window. 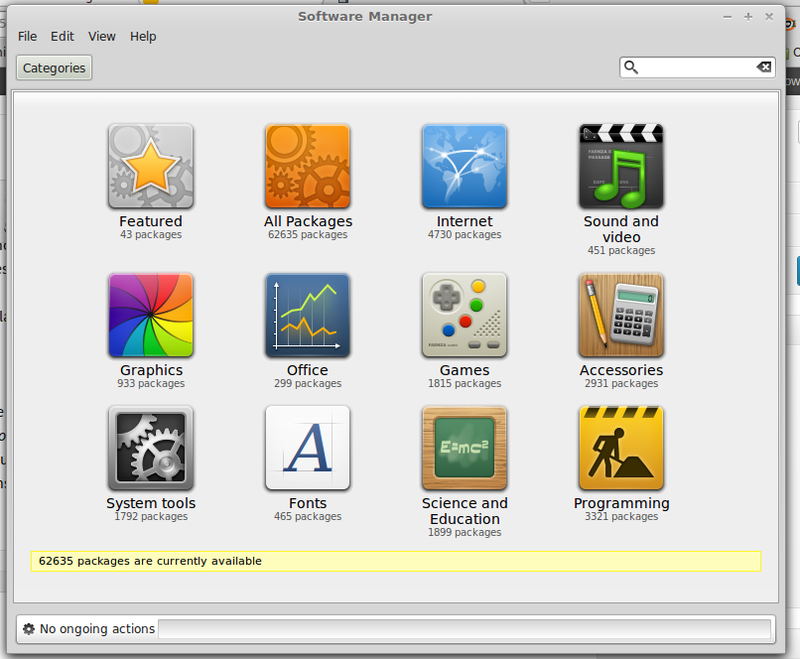 The different color checkboxes indicate the status of a package with: not installed packages in white, installed in green, marked for installation with a tick, marked for removal in orange or red. One thing that you can also do is search using the box in the upper right hand corner. By default this will search through all of the package names and descriptions within the selected category for the text you have entered. If you are unsure of which category the package you are after is in, then the 'All' category can be used to search the name and description of every available package. Hopefully this will help people have a browse of the software that's available for linux. Below is a short description of individual applications mentioned in the presentation and how to install them. Leave any comments or feedback below and if I get enough I'll consider putting together a series of articles on different topics. Here I'll list a few of the application mentioned in the talk and how to install them. 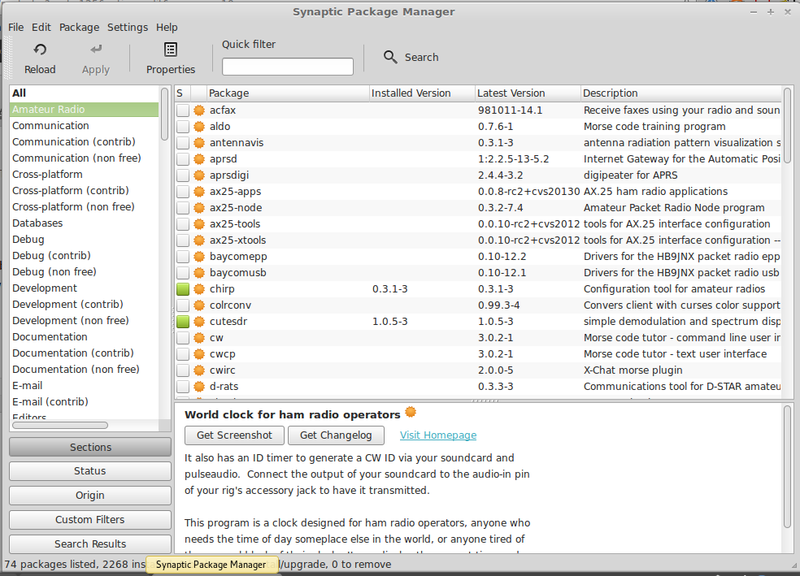 CHIRP is a program for programming radios, and supports a wide variety of transceivers. It can be used to for backing up the memories that are already programmed into a radio, as well as cloning them from one radio to another.